Last week I was wandering around Hastings with my brother, idly sight-seeing. Among the tall black-painted net huts below RockaNore Cliff was the Fisherman’s Museum, empty enough on that cold weekday to examine all the exhibits in enjoyable detail, even the huge model of the Great Harry. 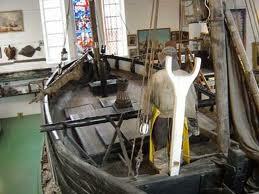 I clambered on to the deck of the old fishing boat in the centre. The walls - although I’m sure that’s not the right word - barely reached the height of my knees. I felt slightly dizzy, even without the swell of the sea. I bought a copy of "Voices from the Stade" The man at the desk was very pleased as he'd been one of the people involved in the collecting the old fisherman's tales and was keen to share his experiences. We ambled on, past “Winkle island” with its shiny new sculpture, eyed the windows of the arty, gift and goth shops, and chatted over lazy tea and cake. Then I saw it. 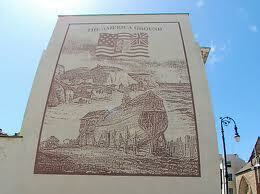 An image painted across a pub wall: The America Ground. It was one of those moments to do with writing when something remarkable happens. Oddments of information loosely connected to a certain topic suddenly start appearing everywhere, even when you aren’t searching or researching for them. Is it that you just didn’t notice such things before? Or does some animus start flinging fascinating details at you, intent on luring you away for weeks or months or years? My current writing project is partly involved with the passion for independence that grew among the people of Europe and America in the late eighteenth century and beyond: a deep longing for rights, equality and liberty, combined with that questioning of the crown, clergy and gentry that led to rebellion and revolution. There, in Hastings, was the story of a small revolution, a time when the local people rebelled and seized their land for themselves. The “land” wasn’t new. It belonged to nobody. Officially, it wasn't there. Back in the thirteenth century, great storms had reshaped the South Coast. The old cinque ports of Rye and Winchelsea were locked inland and the natural harbour behind Lydd island transformed into the Romney salt-marshes. Even the harbour at Hastings was altered. A long shingle bank was thrown up by the waves, blocking the harbour and making land where there was sea before. This new ground lay outside the bounds of the Borough of Hastings so anyone who settled there need pay no rent or taxes to the town. Over time, this No Man’s Land of shacks and upturned boats grew until it held more than a thousand inhabitants. While the great landowners - Lord Cornwallis, the Earl of Chichester, Battle Abbey Estates and the Hastings Corporation – fought each other through the courts for ownership, the place thrived in its own happy rate-free state. Originally a haven to fishermen and boat repairers, by now it had tradesmen, lodging houses, livestock keepers, a rope walk, a bakery and a brewery. 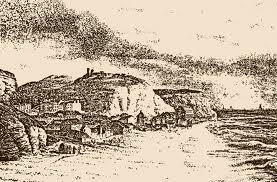 More enterprises followed: limekilns, stonemasons, a tallow factory, a sawing house, a gin palace and even a small school. However, with seaside resorts becoming fashionable, the Hastings councillors decided that this undesirable collection of shacks and huts must be removed. A Crown Commission offered seven-year leases to the inhabitants, after which the land would belong to the Crown. Most refused, taking their shacks and moving further along the coast to St Leonards. So, by 1834, just twelve years later, the America Ground was empty. The Councillors got their way and development followed. Now all that is left to commemorate that small stand for independence is the painting on the outside wall of a pub near Robert Street and the raising of the Stars and Stripes nearby every Fourth of July. Meanwhile, up here in Yorkshire, there’s another area of land that’s nominally part of England but covered by the Stars and Stripes. A different kind of independence. I know the word "fascinating" gets used a lot on here, but it does its job. And that flinging animus - it's worrying how clearly I can see it! I love discoveries like this. I don't know about you but they always make me think, 'Could I write about this?' Sometimes I do but mostly I don't but it never fades and may lie dormant for years before it bubbles up again. Ah yes. Menwith Hill. It always sends chills up my spine whenever I drive past. Top post, Penny, and the cause this morning of some jingoistic smiles in this half American household. Do Google, Sueki. 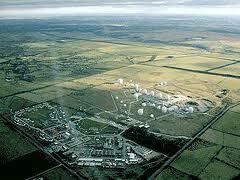 In its simplest form,"RAF" Menwith Hill is an American listening base. Glad you liked the logical leap, Laurie. Sally, how I agree about those lost sparks! I've found a camera most useful for capturing an image of whatever-it-was that inspired me. Those amazing ideas are so easily dislodged by the next layer of everyday life.